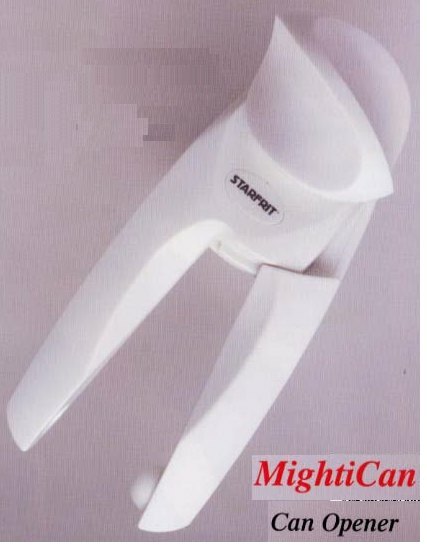 We’ve been using the Starfrit Mightican for a while now. Mandy loves it. I don’t. Let me tell you why. Safe and sanitary. Thanks to its side-cutting action, MagiCan leaves a lid with no sharp edges and no metal shavings. Since the lid is the same diameter as the opening, it can’t fall in. As the lid comes off, it is clamped firmly between the cutting blade and the can-turning mechanism, so it can be easily released into the trash can. You never have to touch it! MagiCan is precision–built from the highest quality metal and plastic for easy cleaning and maximum durability, so it will provide you with many years of safe and effective use. All true, as far as I can tell. So what’s my beef? For starters, though the MightiCan leaves no sharp edges on the lid, it leaves one around the top of the can. Mandy doesn’t care much about that. She dumps the contents of the can into whatever she’s cooking, rinses it out, and leaves it on the counter for me to take out the recycling bin. Though I should be ashamed to admit it, I’m not the most diligent guy when it comes to taking out the recycling. I usually let the cans accumulate on the counter throughout the week and transfer them to the recycling bin on garbage day by grocery bag. Usually there are enough to fill a bag but last week there were only a few. To conserve bags, I threw them in a bag with some paper recyclables to transport them. I’ll let you guess what happened to my finger when I reached into the bag to extract the can to put it in the blue box. It was only a minor cut. It didn’t even need a bandage, but it annoyed me tremendously. Products that are advertised as safe should not make you bleed! Had the can been opened with a traditional top-cutting can opener, the I’d have stored the sharp lid safely in the can, out of harm’s way. The design of the MightiCan ensures that the sharp edge is always exposed. And because the lid doesn’t fit in the can, you are forced to handle twice as many pieces when transferring them to a recycling station. This, combined with the exposed sharp edges makes for a danger surpassing anything you might achieve with a traditional can opener. Gah! Starfrit MightiCan, I bite my thumb at you! Aside from the random sharp edges, which by the way, put a nasty little splinter in my left index finger a few weeks ago. I am annoyed by the way this can opener removes the top lid of the can along with the edge. This may sound trivial until you try to open and drain a can of tuna. In the old fashioned procedure, the can opener would allow you to squeeze the lid into the tuna to push the water out. But with this new can opener, it becomes quite awkward because the lid no longer fits in the can. Instead, it fits on top and I just can’t seem to get all the water out without making a mess and spilling tuna into the sink. Have you realized this as well? Definitely! Don’t bother even trying to open a can of tuna with one of these. It’s absolutely hopeless.